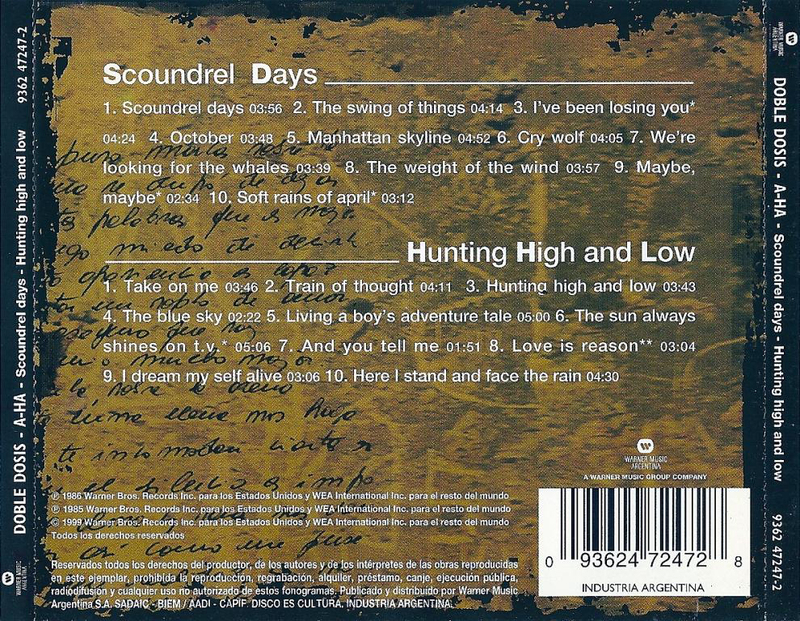 In Australia there was a cassette released which includes both the albums "Hunting High And Low" and "Scoundrel Days". The cover has a black background with the two album covers pictured one below each other. The title is printed in white above. The titles are printed in white on the spine. The reverse of the insert is white with track details in black. The cassette is light grey with blue text. This double release from Argentina has a goldish brown front sleeve with black handwriting style text printed across with gold-toned versions of the "Hunting High and Low" artwork (top right) and "Scoundrel Days" artwork in the bottom left both of which are made to look like they have been taped to the cover with drafting tape. The titles are printed in light gold letters next to the album cover pictures. A-HA is printed in white on a black background in the top right. 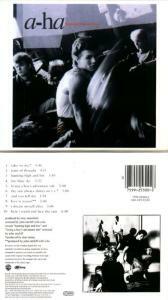 The front sleeve folds out with large colour shots of the "Hunting High and Low" and "Scoundrel Days" artwork on a black background on one side. The reverse is black with the track listings and track information in white and gold letters. The back insert is also goldish brown with black writing plus the track and manufacture information in white. The inside of the back insert is black with a circle of the goldish brown artwork with black writing in the centre. The discs are silver with track information in black, similar to the discs of the regular releases. They include some Manufacturing & Copyright Information in Argentine text. 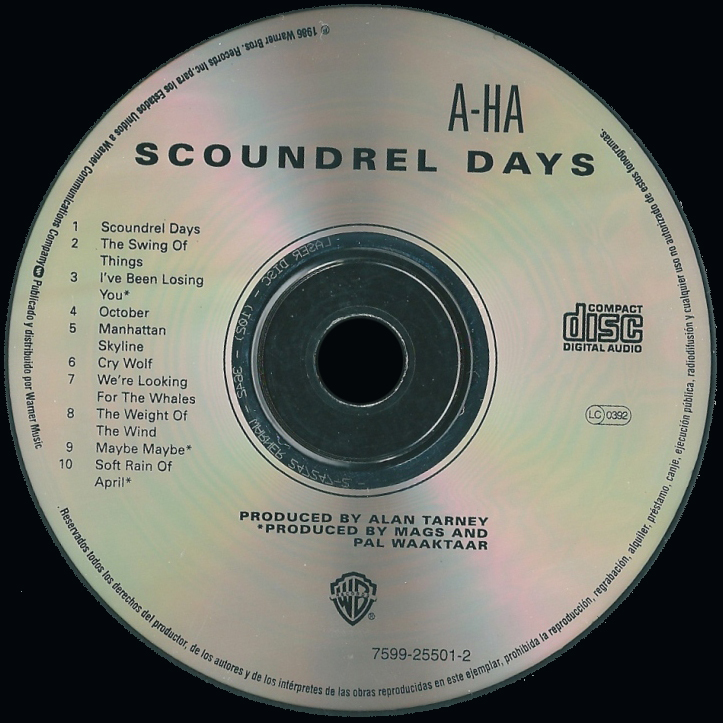 The catalogue number on the "Hunting High and Low" disc is 7599-25300-2 and on the "Scoundrel Days" Disc is 7599-25501-2, however the album set has the number 9362 47247-2. The album comes in a double slimline case. There was also a Chilean version of this double release which is similar to the Argentina release. The front covers appear to be identical. The inside of the insert is again black with track information in white and gold. The back sleves are similar with some differences in the text: The white font used on the back is clearer on the Chile edition which also has the additional text "1999 Warner Music Chile S.A. A WARNER MUSIC GROUP COMPANY Reservados todos los derechos de las obras y del productor de fonográmas, prohibi-da la reprodicción y prestamo de este ejemplar y su radiodifusión o ejecu-ción publica. Ley 17.3336.". The back cover and spine of the Chile release includes an additional wea square logo. The Argintinian release has the text: "Reservados todos los derechos del productor, de los autores y de los intérpretes de las obras reproducidas en este ejemplar, prohibida la reproduccion, regrabación, alquiler, préstamo canje, ejecución publica radiodifusion y cualquier uso no autorizado de estos fonogramas. Publicado y distribuido por Warner Music Argentina S.A. SADAIC - BIEM / AADI - CAPIF DISCO ES CULTURA, INDUSTRIA ARGENTINA.". The text "INDUSTRIA ARGENTINA" is also printed underneath the barcode. The catalogue numbers on both releases are the same. The discs are silver with black text. It has not been confirmed if these are official releases. 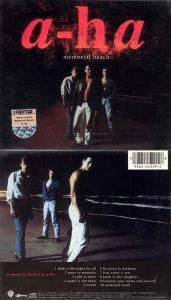 This French release features the albums "Hunting High And Low" and "Stay On These Roads", it was marketed by "WARNER STATEGIC MARKETING FRANCE". The front cover of this cardboard slipcase is beige with a red strip down the left hand side. 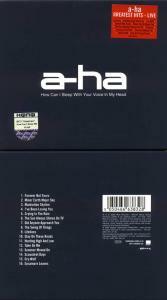 "A-HA" is printed in large black letters at the top of the sleeve with the pictures of the album covers below and titles again in large black lettering along the bottom. "Coffret 2 CD Originaux" is printed on the red strip in beige and white text and includes some images of silver Compact discs above. The back sleeve is of similar colour design except that the red strip is on the right hand side. Some very small black text "conception graphique NOC nuit de chine" is displayed down the side of the red spine, which refers to where the slipcase was printed. There is some other information about the band's career all displayed in french at the top of the sleeve; "Au début des années 1980, Pal Waaktaar et Magne Furuholmen, ex-membres de Bridges, créent un nouveau groupe, A-Ha, bientot rejoint par Morten Harket. En moins de trois ans, ils classent leur titre Take On Me, extrait de l'album Hunting High And Low, n° 2 des charts britanniques, largement aidés par un vidéo-clip trés original mélant dessins et scénes réelles. Les Etats-Unis aussi leur font les yeux doux, suivis par le monde entier, et un autre titre de l'album, The Sun Always Shines On TV, séduit à son tour les foules. Au total, quatre des extraits se classeront ainsi au Top 10. Alors que la presse le considére surtout comme un phénomène de "teenage sensation", A-Ha surprend par la densitè de son écriture sur les disques suivants. Aprés une tournée mondiale, il compose la bande sonore du film de James Bond The Living Daylights, dont un remix apparait sur son troisiéme album, Stay On These Roads, et se hisse dans les charts. Utilisant largement les synthétisurs, ce disque à l'humeur variée et au ton plus adulte donne lieu à deux autres tubes, Touchy ! et You Are The One. Puis, aprés d'autres albums allant dans la mème direction musicale, les membres de A-Ha se consacrent à des activitès de plus en plus diversifièes... et de moins en moins communes. The full track listing to each album is included at the lower half of the back sleeve in black, with the album titles being in red. The spine displays two silver overlapping Compact discs at the top, with the same text "Coffret 2 CD Originaux" included underneath. 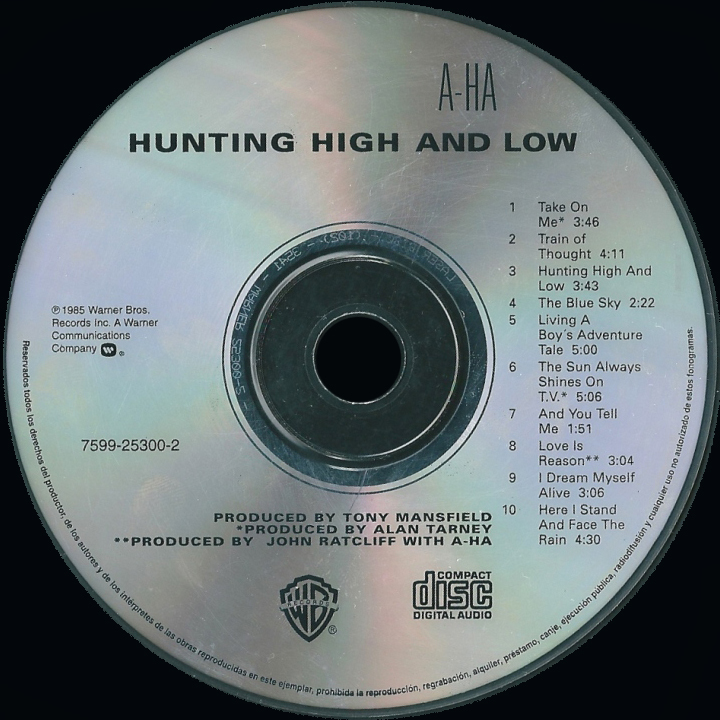 The titles "A-HA HUNTING HIGH AND LOW" and "STAY ON THESE ROADS" are printed in white and displayed in the centre, whilst at the bottom of the spine, there is a black and white "WARNER STATEGIC MARKETING FRANCE" logo. On the top section of the slipcase, it again includes the silver Compact disc images and "Coffret 2 CD Originaux" text, plus "A-HA HUNTING HIGH AND LOW / STAY ON THESE ROADS" in black. The bottom section of the slipcase instead includes a "WARNER STATEGIC MARKETING FRANCE" black and white logo, Catalogue number 9362-47937-2 WE 859 and white barcode "0 93624 79372 4". There is also some french Copyright and Marketing Information shown; "Tous droits du producteur phonographique et du propriètaire de l'oeuvre enregistrèe rèserves. Sauf autorisation, la duplication, la location, le prèt, l'utilisation de ce disque pour exècution publique et radiodiffusion sont interdits! une division de warner music france - a warner music group company © 2000 warner strategic marketing france/warner music france". The year of this release appears to be around 2000. This double album CD was a limited edition Italian release. Both albums are recorded onto one CD and have been digitally remastered. The background of the cover is brown with black swirls and has a-ha printed in white at the top. Below are the cover photos of the two albums pictured side by side. It is not known whether or not this is an official release. Italy Stay On These Roads / Scoundrel Days ? 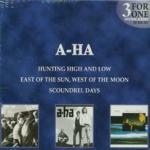 This 3 CD set contains the albums "Hunting High And Low", "East Of The Sun, West Of The Moon" and "Scoundrel Days". The cover is dark blue with small pictures of the three album covers along the bottom. 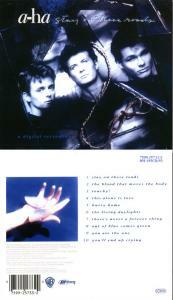 "A-HA" and the names of the albums are printed above the cover shots in the centre. "3 For One Original Albums CD Box Set" is printed in the top right hand corner. The reverse of the cover is also dark blue with tracks lists printed in white in the centre plus small shots of the album sleeves at the bottom. The "3 For One" logo is printed in the top right hand corner and A-HA is printed in the top left hand corner. This box set was also available in Australia. This German 2 CD Hit collection features the albums "Hunting High And Low" and "Lifelines". On the front cover is an up to date band shot (Paul, Morten, Magne). Two small pictures of the album covers are printed on the left hand side over part of Paul. 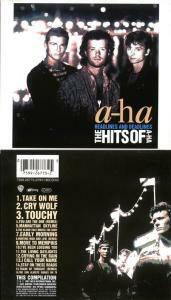 2CD Box is printed in white letters on a blue background in the top left hand side of the sleeve with a-ha and 2 CD Hit Collecton printed in the bottom right hand corner. The reverse of the sleeve again features small pictures of the album sleeves with the track listings printed underneath. A smaller band shot (Magne, Morten, Paul) taken from the same photo shoot is printed on the left hand side. This box set was available in different German CD-stores such as Karstadt. This German 2 CD Box was available through "ALDI" supermarkets in Germany. 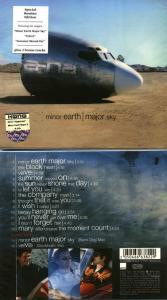 It features the albums "Headline And Deadlines" and "Minor Earth, Major Sky". The front of the box is green with a band shot (taken from the cover of Headlines And Deadlines) across the middle, plus two shots of the album covers on the left hand side. The titles of the albums are printed in white across the top of the sleeve on a brighter green strip. "2 CD Box" is printed in yellow in the bottom right hand corner of the box. This French 2 CD box set includes the albums "Hunting High And Low" and "Stay On These Roads". The front of the box is beige with a light brown strip down the left hand side. 2CD is printed in beige letters down the strip. Pictures of both album sleeves are printed in the middle of the sleeve with some black outlined boxes behind. 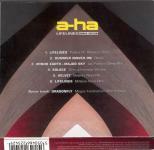 A-HA is printed in black above the cover pictures with the album titles below. The reverse of the box has similar design, except that the light brown strip is printed across the top. The track listings of the albums are printed inside the box outlines with small cover pictures below (Hunting High And Low) and above (Stay On These Roads). In 2003, the a-ha albums were re-issued in Russia (except Lifelines which was issued in 2002), all coming in card slip-cases. The following pictures show the front of the slip-case with the reverse of the slipcase below. 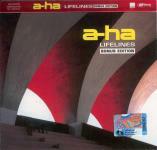 Details of the Lifeline (bonus edition) can be found under Lifelines single. There is also a limited edition "box set" "a-ha hits collection" which includes the 4 Russian albums: Lifelines, Lifelines (bonus edition), Minor Earth Major Sky and The Singles collection. The Lifelines album includes the introduction and two bonus tracks "Minor Earth Major Sky (ATB Mix)" and Velvet (De-Phazz Mix) as per the regular Russian release. "Minor Earth | Major Sky" also includes the two bonus tracks Minor Earth Major Sky (Black Dog Mix) and Velvet (Stockholm Mix). The card slip case which houses the four albums is red with "a-ha" printed in white letters acorss the middle with "HITS COLLECTION" in yellow underneath. "Limited Edition" is printed in yellow letters across the bottom of the sleeve. Russia boxset a-ha Hits Collection / ? On 5 December, Warner Brothers released the "a-ha Trilogy Three Classic Albums" set in the UK. The packaging is like a hard-back book with the title and three small pictures of the covers of the featured albums (Hunting High And Low, Scoundrel Days and Stay On These Roads) on a grey background. There is also a large white 3 across the sleeve which goes behind the pictures. The reverse of the "book" is black, again with pictures of the three albums and track listings below. 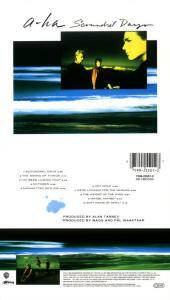 Pictures of the album covers also feature on the "spine" of the book with the title. Inside, the three CDs are housed on transparent CD trays which open like pages of the book. All CDs are regular copies of the album, German made. The CD inserts can be found in a pocket on the left hand side, there is also a leaflet advertising trilogy series by other artists. The Australian edition comes in a grey and white cardboard slipcase. The front of the slipcase has colour shots of the three album covers with titles in light blue below (HH&L and SD) or above (SOTR). TRILOGY and A-HA are printed in large light blue letters above. In the top right hand corner is the text "3 for one original albums CD box set in white a blue letters on a light blue oval background. The back of the case is of similar design to the front but with smaller cover shots plus the track listings. The albums are Australian pressings, similar to the regular release. The album "Hunting High And Low" does not include the adverts for other artists inside the insert. 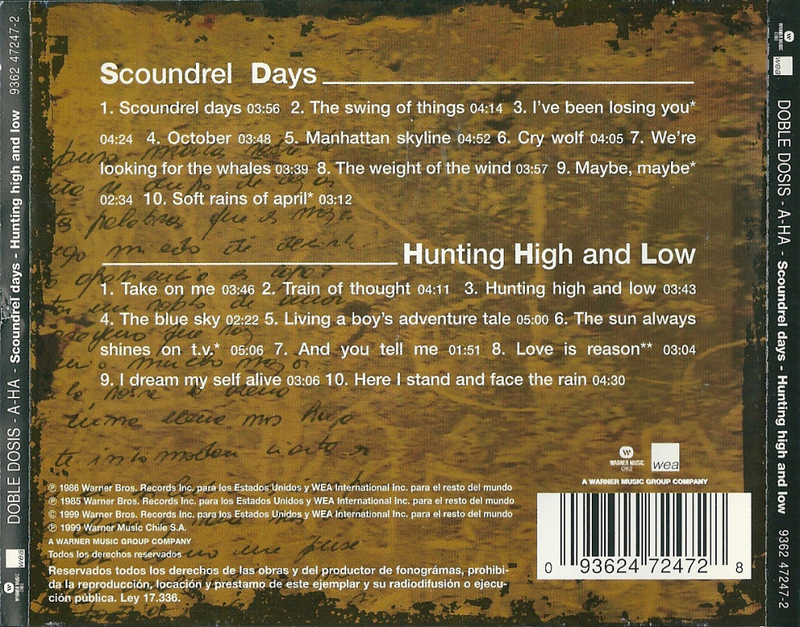 The discs for "Hunting High And Low" and "Scoundrel Days" are black with silver text, whereas "Stay On These Roads" is the usual silver with black text. The South African release is quite different from the UK made edition and comes in a thick 3-way jewel case rather than the card sleeve. The cover artwork is similar to the UK release but the three album covers printed on the front are larger. The back sleeve does not include the test "A-HA THREE CLASSIC ALBUMS". The marketed & distributed by Gallo text is printed on the back sleeve along with the Gallo Logo (in place of the Rhino Logo). It comes with a 6 page booklet with pictures and track listings of the three albums on a black background, but there are no lyrics. Unlike the UK release, each disc is a different colour, the "Hunting High And Low" disc is red with black text, the "Scoundrel Days" disc is mint green with black text and the "Stay On These Roads" disc is light grey with black text. A European "2 for 1" double CD album set was released by Universal International Music B.V. It contains "Foot Of The Mountain" and "Analogue" but comes without lyric booklets. The inserts are light blue and shiny with small shots of the album artwork on the front and back. On the front insert, the titles are in white and black at the top with the black "2 for 1" above. There is also a large "+" between the two album covers. The back sleeve also has the "2 for 1" logo plus the album titles in white and the tracks listed in black underneath. The following text in black is printed in the top right of the back sleeve: "2011 UNIVERSAL INTERNATIONAL MUSIC B.V. COPYRIGHT EXISTS IN ALL RECORDS ISSUED BY UNIVERSAL INTERNATIONAL MUSIC B.V. ALL RIGHTS RESERVED. UNAUTHORISED COPYING, REPRODUCTION, HIRING, LENDING, PUBLIC PERFORMANCE AND BROADCASTING PROHIBITED. MADE IN EU. BIEM/SDRM. LC08427. UPC:(SET) 0600753359556. (ALBUM 1) 0602527089980 (ALBUM 2) 0602498746998". The inside of the front insert is the cover shot of "Foot Of The Mountain" and the cover shot of "Analogue" is underneath the CD tray. Both are printed on the shiny pale blue paper, rather than white. The discs are the regular European album discs. The spine of the album has a typo and says "A-HA FOOT OF THE MOUNTAIN + ANALOGUELF". This 5-CD album set comprises of "Hunting High And Low", "Scoundrel Days", "Stay On These Roads", "East Of The Sun West Of The Moon" and "Memorial Beach". It was released in the UK on 13 June 2011. Each disc comes in a card wallet picture sleeve and are housed in a card slip-case. The front and backs of the album sleeves are similar to the regular album cover but with a coloured border (Red (HH&L), Green (SD), Blue (SOTR), Brown (EOTS), Red (MB)). A coloured strip at the top and bottom of the disc (Pink (HH&L), Green (SD), Blue (SOTR), Brown (EOTS), Red (MB)) with a large beige rectangular block across the middle with the tracks listed in the colour of the colour strips. The a-ha logo is printed in beige at the top and album title plus the catalogue number and WB logo in beige at the bottom. The CDs do not come with booklets. The cover of the slipcase features an orange toned shot of the band from the 80's (Mags, Morten, Paul) with a red transparent strip across the middle on which the five album covers are pictures. 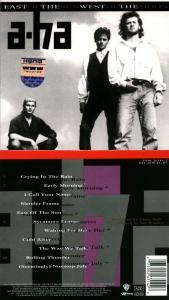 The a-ha and the title are printed in white above the album sleeves. The back of the slip-case is brown with a red rectangle at the top over which the five album sleeves plus title are printed. The titles of the albums and track listings are printed in respectively orange and white below. The spine is red with a brown border, titles in white and the WB logo in orange. The front and back covers plus spine have a white border. It was released on the Rhino record label. There is a Brazilian Pressing of the "Original Album Series" which is similar to the UK edition but includes some Brazilian Record Company information, the flying Amazon bird logo and Warner music Brazil web links. 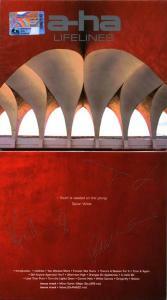 1000 copies were pressed which is indicated by the A0001000 code printed on the spine. Malaysia: The European edition was used in Malaysia. It comes with a silver "ULEN KPDN & HEP ORIGINAL" / "ori" hologram Sticker, plus an Imported Warner Music Grey, Blue & White Sticker containing the Record Company Address in Malaysia.